This story is a prequel to "The Wedsworth Townsend Act" when Johnny first graduated from the academy and joined L.A. County Fire Station 10. _ DISCLAIMER: "Emergency!" and its characters © Mark VII Productions, Inc. and Universal Studios. All rights reserved. No infringement of any copyrights or trademarks is intended or should be inferred. This is a work of fiction. This story is only written for entertainment. No financial gain is being realized from it. The story, itself, is the property of the author. I must've ridden by here at least a hundred times since I got my assignment. There it is a couple of blocks down, the station, my station. Smiling to himself the young man leaned on the handle bars to his Yamaha cycle pondering the beginning of his career with the L.A. County Fire Department. He heard the tones, watched the doors slowly rise, and leaned forward not wanting to miss the parade of vehicles as they poured from the bays. The wind from the passing vehicles blew his tousled hair from his face, the bike beneath him swayed from the gusts. The crooked grin plastered across his face did not go unnoticed by the Engineer as they sped by. "Hey Cap, what do you wanna bet that kid is one of our new recruits." "Well Scotty my man, I seem to remember another young recruit sitting on the hood of his car in just about the same spot when I was an Engineer. Now he's one of my most trusted men." Engineer Dale Scott smiled at his Captain. "Yeah." The both chuckled at the memory. "But to answer your bet, I would win. That's John Gage, top of the class, new boot at our station. I got his picture in his personnel folder yesterday. He'll be under your wing." "Why me Cap? I trained the last boot." "Well Scotty, I've been watching him pass the station and sit out there watching us for a few days. He's had a rough go of it. According to his paperwork the other probies gave him hell during training. He's half Indian. You won't hold that against him. I can't say for sure that some of the other guys will give him the chance to prove himself as a good fire fighter or wash him out before he even gets started. This probationary period will really test that young man." "Okay Cap, you're the boss." Johnny watched the parade of vehicles until the last one disappeared on the horizon. Gripping the handle bars he kicked the cycle to life, turned into traffic and followed the sounds of the Fire Department as they raced to the scene of their call. The adrenalin mounted in his veins as he first saw the plume of smoke rise in the sky and then the multitude of equipment at the scene. "Well Scotty if you're finished checking out our new boot over there, you can charge the hoses." The Captain slapped him on the back and walked away laughing. "Yes sir you'll keep an eye on him, Scotty that you will." Scotty laughed as he adjusted the water pressure and turned his attention back to the job at hand. The hairs on his neck stood up, his arms dropped to his sides; he rose slowly from his leaning stance and stepping a few steps forward he froze. Scotty saw the movement out of the corner of his eyes. 'What are you up to boot?' Following the younger man's gaze he saw the smoke slipping back into the building. Grabbing the HT, "Cap it's gonna flash!" he screamed into the radio. "Back right section, it's gonna flash! Get out! Cap, get out now!" The warning heard the men from Station 10 dropped their hoses and scattered from the building just as all hell broke loose. Explosions rocked the warehouse sending debris raining down all around the area. Johnny spent the next couple of days preparing for his first shift at Station 10. Arriving at headquarters as soon as they opened at 9 o'clock in the morning, as the top man in his class he was first in line to get the starched blue shirts, the navy slacks, regulation boots, protective helmet, department badge and his nametag, J. Gage. Then he was presented his turnout gear. Running his fingers along the stenciled name on the back, G A G E, feeling the rough fabric beneath shaky hands, he trembled at the realization that tomorrow he would be riding an engine for the first time as a certified Fireman. "Welcome to the department Mr. Gage." He took the outstretched hand of the Battalion Chief gripping it hard like his grandfather had taught him. 'A strong handshake shows strength of character.' Johnny smiled at the memory and lowered his hand placing it back on the rough fabric of the turnout gear, his gear. The last thing the new recruits were presented with hung on hangers in zippered plastic suit bags. Hooked on the hanger the stark white dress hat hung draped in clear plastic. Johnny knew that inside the bag he would find his dress uniform. 'I hope I don't have to wear these anytime soon.' Like most Firemen he knew the dress uniforms were mostly worn at funerals and retirements. "Men as of today you are a member of the L.A. County Fire Department. Wear those uniforms proudly. Fight every fire as though your life depends on it. It very well may. Protect your crew mates. Watch their backs, they'll be watching yours. Some of you will report to your stations this afternoon. The rest of you will report at 0900 hours tomorrow morning, dismissed." Pushing through the exit door he followed the rest of the new recruits out. He neatly folded his uniforms into the pouch on the back of his cycle. "Hey Tonto several of us are heading over to O'Malley's to celebrate. We need an injun to sit among us cowboys." The man rejoined his friends all laughing at the bad joke. Johnny ducked his head and ignored them. Climbing onto the bike he gripped the handle bars until his knuckles turned white. He pushed the motorcycle back out of the parking space, turning it to the street and throwing dust as he pulled away from headquarters. He was up before the alarm, pacing the floor of his scantly furnished apartment. Stooping he grabbed the handles of the duffel and left the tiny apartment, early. Arriving at the station he pulled around the side of the building only to find that he couldn't find an empty space. Fortunately his cycle would fit nicely beside the truck in the last space and the fence that housed the trash dumpster. 'Well that's one good thing about not being able to afford a car. My bike fits almost anywhere.' He pushed it back into the space, lifted his leg over the seat while unstrapping his motorcycle helmet. Turning to face the back of the large fire station he stood in awe of the sheer size of it. The doors stood open allowing a view of the equipment lined up inside. Several other firemen began piling out of the other vehicles. 'I guess I'd better head on in. These guys must be part of my shift. I'll ask that guy over there where to find the Captain's office.' Johnny reached for the straps that held his duffel bag on the back of his ride unbuckled them, grabbed up the bag and walked slowly toward the building. "Well if it isn't Tonto." A burly man about the same 6'1" height as Johnny but a good 50 pounds heavier spoke from across the lot. Johnny glanced over his shoulder and groaned to himself. He could only guess by his the stranger's appearance that he must be a relative of one of the guys that attended the academy with him. "Cody said to say hello, Tonto." Johnny kept walking not looking or responding to the taunts. 'Man will I ever get away from those jerks. I thought after the academy, after graduating at the top of the class I would get a little respect. I guess not.' He thought sadly. "Excuse me could you tell me where I might find the Captain." "He's in the office, last door on the left." "Thanks." Johnny gave a small smile and went in the direction the man had pointed. Knocking on the door he waited for an invitation. "Enter." Captain Jones called out. He opened the door, "Excuse me. I'm John Gage reporting for duty." "Come on in John. I'm sure you know Jeff Swanson." Johnny nodded greeting to the other man. Jeff didn't move or acknowledge his presence. Johnny stood waiting for the Captain to move the conversation forward. "I was just telling Jeff here that due to the size of our station you have both been assigned here as well as Cody Graves. His brother Jim is one of our linemen." 'Well that explains the jerk in the parking lot' Johnny thought. "You'll be on different rigs. I'll have one of our senior men work with each of you today helping familiarize you with our equipment. Jeff you will be on the ladder truck. John you will be on Engine 1. Cody will be with his brother on Engine 2. Each of you will work with the Engineers this shift. You will shadow them until I tell you to do otherwise, understood?" "Yes sir," both men responded. "Now John you will report to Dale Scott. He's probably in the kitchen getting coffee. Jeff you will be with Gary Cooper, and yes he was named after the actor. But don't ask him about it. He hates it when he has to explain about how much his mother loved the actor. They'll show you your lockers and where to stow your turnouts on the rigs. Dismissed." Both men moved to leave. "Yes sir." Johnny paused and turned to face his new captain. "Close the door." Johnny did as instructed. "Listen I know you probably already know this, but your standing as top of your academy class is already public knowledge. As I'm also sure you already know boots fall victim to a lot of pranks. You can expect more directed at you, because you're good. Just be prepared, okay." Johnny's gaze fell to his boots, "Yes sir, I'm used to it. It won't be a problem." "Good, now how about some coffee?" The Captain reached out and shook Johnny's hand. "No thanks. I don't drink coffee." "Well son, that's one thing that will change fast at a fire station. Without coffee we'd be walking in our sleep most of the time. Come on I'll introduce you to Scotty...um Dale Scott." He chuckled. Johnny followed him to the kitchen. "Look at Tonto already suckin' up to Cap," Cody Graves could be heard talking to his brother. "I knew it wouldn't take him long to kiss up to the brass." "Keep it down Cody. Don't let Cap hear you call him that. You'll be the one in trouble, and you don't ever want to piss Cap off." Jim scolded his younger brother. Johnny shot a glare at the man. It only lasted for a split second. It was only a flicker of emotion. Dale Scott saw the interchange and then he watched Johnny's emotionless mask fall back into place. He looked away and pretended he hadn't noticed. "Scotty, this is John Gage. He's assigned to you for the next few shifts. Show him the engine and where to stow his gear." "Sure Cap. Come on kid." He pushed off the wall he leaned against. "Just lemme get a refill. Want some coffee?" "No thanks." Johnny shrugged. "I uh...I don't drink it." "What? No way man! You will. Mark my words you'll drink it alright, probably by the end of the month. Yes siree you'll learn to love it." Scotty filled his cup and returned the pot to the burner. "Come on I'll show you to the lockers first. After you put your things away I'll show you my baby. Johnny followed him from the room and across the apparatus bay. "Over here we have the locker room, latrines, and showers. Upstairs is the bunkroom and dayroom complete with weights and the TV." Entering the locker room they could hear voices. "Don't worry about it Cody. He's on a different engine. We could very well be on different sides of a fire. Cap knows you're my brother. He won't wash you out. You're family. Just leave that Indian to us. You know how the department guys treat boots. Well our little Native American will get worse than either of you other two. We'll see to that. He'll probably ask for a transfer or wash himself out when we're done." Scotty looked over at his charge noting that his face didn't reveal that he'd heard the exchange, but in his eyes he could see hurt, pain, and sorrow. 'This kid has seen some tough times. I wonder what his story is. He does a good job of masking his face, but those eyes tell all.' He thought to himself. "My locker is over here and there's an empty one next to it. You may as well have that one." Johnny opened the empty locker, unzipped his duffel, pulled out his extra uniforms and hung them on the hook. Then he removed his turnouts and helmet, re-zipped the bag and slid it into the locker, placed his bunker pants and boots in the bottom of the cabinet and closed the door. They made their way through the bay and to the engine parked in the first space just inside the large roll up bay door. Beside it a smaller truck sat waiting for the tones to call it into service. It had compartments on both sides, oxygen tanks lining the center of the bed and more larger compartments there as well. "Here's my baby," Scotty said as they approached. Johnny's attention seemed drawn to the smaller vehicle, but Scotty continued talking about the engine. "She's a beauty isn't she?" Johnny realizing that he had not been listening to the engineer suddenly focused his concentration on what Scotty spoke about. The red engine stood in all its glory. "Yeah she's a real nice rig." "Nice? She's the best rig in L.A. County." The pride Scotty had for his engine could be seen all over his expressive face and in his eyes. "Now you'll be riding here behind me. Bill rides on the other side and Cap rides shotgun. You should feel honored to be on the same rig as the Cap. He usually puts probies on the other rigs." "Oh." Johnny responded but no emotion came across his face. "Yeah. Well anyway you'll keep your coat either on your seat or hanging on the door. Your helmet goes on the seat, so you can grab it fast." Johnny hung his coat on the door like the others had been placed and lay his helmet on his seat. He took a little time to glance around the interior of the rig. "Uh now what?" "Now I'll show you every inch of this baby, starting with the cab." Scotty took a long time in showing Johnny around the engine. He had seen engines at the academy and brief instruction about how they worked, but since hauling hose was his primary responsibility more attention was spent on the aspects of the tasks a lineman performed. The workings of an engine were the responsibility of an Engineer, and you had to be a lineman for several years before becoming eligible to take the Engineer's exam. "Roll call in five Scotty," one of the other Engineers with Jeff following close behind informed them. "Thanks. I guess we'll finish the tour of the Engine after roll call. Cap prefers we meet in the kitchen." As they entered the kitchen Johnny could see all the men of his shift gathered together. There had to be at least fifteen or twenty men in the room. "Okay men I hope you're all rested up, because today you have the pleasure of hose and hydrant drills at the fairgrounds. We'll head on over there right after lunch unless we're toned out. Before assignments I want to introduce you to our newest crew members. First we have one of our little brothers that I'm proud to say has passed the academy. Everyone give a warm welcome to Jim's baby brother, Cody Graves." There was a round of applause and several whoops. Several men slapped Cody on the back. He was clearly ecstatic at the welcoming he received. "Next we have Jeff Swanson whose grandfather is retired Chief Swanson." Several men shook hands with Jeff and a round of hey and glad to have you was heard. "Finally, I want to introduce you to the top man of the last graduating class, John Gage." A few nods and a couple of handshakes later Johnny clearly embarrassed, but not overly surprised at the small greeting he got, again lowered his eyes to gaze at his boots. The cold welcome given to the young man didn't go unnoticed by Captain Jones or Scotty. "Okay before I dole out your duties for this shift I want to give you seasoned firemen a word of warning. The department frowns on the mistreatment of probies. I expect these men to be treated with respect. I do not want anyone getting hurt, so lay off the pranks. Understood?" No one answered. No one looked in the direction of the Captain. "UNDERSTOOD?" he barked at them. "Yes sir." the group of men all said together. "Now that we have that out of the way, Graves...uh Jim, you, Cody and Gotchalk have the latrines; Brady, Scotty, Gage and Wheeler the dorms; Miller, Cooper, Swanson and Smith, you have kitchen detail; Martin, Coleman and Patterson the bay. The rest of you can hang hose and watch the rigs, dismissed." "Well John since we have dorm duty I may as well show you your bunk, and the pole." Johnny followed Scotty up two flights of stairs to a large open room that served as the station's dormitory. There were beds in rows against the wall with a small table between each set of two. "Here's your bunk John." Scotty pointed to the bunk that stood at the end of the row near the weights and other exercise equipment. "Over here is the workout area and on the far end over there is the dayroom with the TV." Johnny looked around the room taking in the large number of beds to be changed, "I guess we'd better start changing these beds." "Yep, I think your right. It does take a while to get them all done. We'll take the right and leave the left row for the other guys. Let me show you where the linens are. Johnny followed him to a bank of cabinets at the end of the room. "Now after we strip the beds we put the dirty things in this laundry chute. There's a rolling bin at the bottom. "So grab some sheets and let's get this done." Johnny was no stranger to hard work and in no time the two men were finished with their half of the room. "Uh w..where can a...a guy get something cold to drink around here?" Johnny asked. "Let's stop by the kitchen for a break before we finish our tour of the engine. I think we might find something that you do drink there." "Well yeah we've got milk. I mean usually it goes on cereal or in coffee around here, but we have it." After a stop in the kitchen and watching Johnny gulp down two tall glasses of cold milk which left a milk mustache that he unceremoniously wiped on the back of his hand, they resumed the engine tour. It had been a slow morning at Station 10, but as it normally goes at a fire station, that was about to change. The tones rang out through the station and men ran from all directions to their spots. Turn out coats flew through the air as they were whipped around the heads of firemen and arms slid into them. Engine 1 started rolling as Captain Jones jumped aboard. Johnny could feel the excitement growing. He sat up tall and proud with his helmet strapped securely under his chin. Turning sideways in his seat he peered out looking for signs of the fire they were being called to. Scotty could see his face in side mirror. He could see the sparkle dancing in the deep brown eyes, the wide lopsided grin across the young face. 'Yes sir probie, you have a fire in your belly and a desire in your heart. You're going to make a good fireman. When I get through teaching you the tricks of the trade you'll be a fire fighting machine.' He chuckled to himself. Energy flowed through his body. He sat facing the hose-bed bouncing with the movement of the engine as it sped toward the call. The radio emitted constant chatter from the dispatcher and responding units. With each bouncing motion came more enthusiasm; more eagerness. 'I can't believe I'm actually doing it. I'm finally riding an engine, and we're responding to a call.' A lopsided grin spread slowly across his young face as he became adjusted to the constant rocking action of his seat in the vehicle. His fingers absently drummed on his bouncing knee matching the rhythm created by the wheels against the pavement. Like the engine he moved continuously, shifting, and looking. He swayed as the engine turned a corner tilting slightly. He felt himself leaning into the seat as the engine braked for a car that hadn't moved out of the way. Turning sideways in his seat he could see the large steering wheel and the skilled hands that controlled the direction they were traveling in. Dale Scott loved his engine; that was apparent to anyone watching him drive. Johnny could see the corners of his eyes lifted to match the smile that he had on his face. It wasn't a toothy smile. His lips simply curled up in the corners in complete satisfaction and his eyes matched. As they approached each intersection the air horn rang loudly alerting the other drivers of their presence. Dale slowed as he neared the cross streets making sure everyone stopped to let them pass. The cars in front moved to the sides of the road for the engine like Moses parted the Red Sea. He felt the engine slow and turn. As it did he also turned, back toward the front, hoping to see what tragedy had called them out. Scotty pulled the engine up next to the hydrant. Bill jumped down and pulled the feeder hose draping it around the hydrant and stepping on the end to wait for the engine to pull forward into position. Johnny watched, studying each man's actions. He'd been through extensive training at the academy, but his experience as a young boy watching his dad with the horses on their ranch; then handling them himself had taught him that seeing in a controlled situation is not the same thing as doing them yourself when it really counts. Once the engine came to a stop Captain Jones already had the HT to his mouth barking out orders to the other rigs as he disembarked from the vehicle. Scotty had also slid from his seat and already stood beside the control panel setting the gages and signaling to Bill to release the water from the hydrant. Johnny joined Scotty beside the engine and waited for instructions. He knew that if it were not his first day he too would be pulling hoses preparing to battle the beast. Bill ran over and pulled a 2 ½ from the engine and joined Captain Jones in front of the abandoned building they'd been called to. Flames licked at the window frames that had once held glass. Smoke slipped through open cracks between sagging rotted wood slats that lined the once strong walls. Men from the other engine mimicked Bill and Captain Jones. With one hand on Bill's shoulder and the other pulling the heavy water filled hose Cap backed up his lineman. Bill moved the nozzle from side to side effectively spreading water over the outside wall of the building and dousing the flames that tore at the dilapidated structure. Then Captain Jones called to him. "Gage, come over here and back Bill up." He raised the HT and called for Cody and Jeff to back up the other linemen. There were no victims and no buildings nearby that would be threatened by this fire, so they would be allowed to practice their skills. Glancing briefly at Scotty, Johnny moved into action. He jogged over and placed his hand firmly on Bill's shoulder. He wrapped his other hand around the hose just as his Captain had and together they moved closer to the burning building. Step for step Johnny matched Bill's stride. He could feel the water pulsing through the hose in his gloved hand. He turned back to his gauges, checked the readings and resumed his watchful stance. As an engineer it was his job to keep the pressure at the correct level, but also to keep a watchful eye on the scene. He had the advantage of being able to keep his eyes open for problems and in effect support the Captain in maintaining everyone's safety. That is one reason the Engineer is second in command. It didn't take them long to get the fire under control and out. "Good job Gage." Bill congratulated him as they pulled the hose back toward the engine. "I'll let you back me up again." He smiled and nudged Johnny playfully on the shoulder. Johnny's smile beamed with joy at his own skills. He'd done it. He'd fought his first fire. Well the ones at the academy didn't count. There had always been a trained crew ready to take over if the trainees didn't perform well. This time there had been no other team to take over if he had failed, but he hadn't failed. He had done an excellent job and he knew it. Walking back to the engine with a spring in his step he was also greeted with praise from his trainer. "Well Boot, I guess you may make a fireman yet." Scotty slapped him on the back and laughed. "You done good kid." "Okay men let's get this place cleaned up and these hoses reloaded so we can get to our drills." Captain Jones' voice could be heard echoing from radios around the scene. Hoses were rolled and reloaded on the backs of the engines by some men while others started the work of making sure there were no missed hot spots. The crew from the ladder truck who had waited patiently watching the others fight the fire now took part in helping with the overhaul. Together the entire crew from Station 10 made short work of finishing up. Once they all found their way back to their respective vehicles Captain Jones called the Station in as available. Then the line of vehicles paraded to the fair grounds for their planned hose drills. When they arrived the skilled Engineers positioned their vehicles in a wide circle in essence setting up a training corral. All of the members of the crew gathered in front of the ladder truck and waited for instructions from their Captain. "Okay men the purpose of today's drill is to demonstrate the knowledge of our newest crew members. I want to see how well they can handle the hoses and hydrants. Most of you will just be watching, but you should all be prepared to participate if I call on you." The Captain walked over to the three boots. "Now Gage you're up first. I want to see what you can do with the hydrant. Cooper you can time these guys." Johnny stepped over to the hydrant. 'Well here we go. It's time to prove I can do this.' 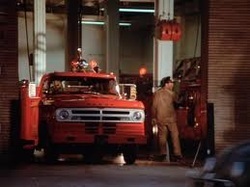 He pulled out his hydrant wrench and stood ready to uncap the sides, attach the hoses and turn on the water pressure. 'I've done this a hundred times. This is no different than practicing during training. These guys are no different than the guys in the academy. Sure they have a little more experience, but they're just guys.' He tried to calm himself. "Go," Cooper called to him and he flew into action. His able hands quickly twisted the caps off, flushed the hydrant, and secured the supply lines in place. He twisted the pressure control on top of the hydrant and released the water. He raised his hands in the air his task complete, "Time." He turned to his Captain for further instructions. "Okay Gage, reverse your actions. Let's see how you do putting it all back. Swanson, you'll go next." Johnny stepped back into position and waited for the call to start. Cooper once again called it, and he once again skillfully completed the task. Cooper jotted down the time on his note pad and whistled. "Cap he just beat Scotty's time by 3 seconds." Johnny could hear several comments being made among the group of spectators. He could only guess that they were not as impressed with his performance as his Captain was. Jeff Swanson stepped up to the hydrant to go next. Cooper called to him to start. Jeff fumbled with the hydrant caps. After almost an entire minute he had them off and was flushing the hydrant. He slowly attached the supply lines and turned the hydrant water supply on. He raised his shaking hands in the air. "Time." "Well Swanson, I think you'll need to practice on that in your free time. Now do it in reverse." Cap shook his head. He didn't need to hear the time from Cooper. He knew it was too slow. Jeff reversed his actions and called time again. He trudged over to his place in line with his head hung and his shoulders drooping. Johnny patted him on the back to offer his support. Jeff looked at him from the corner of his eye and then looked away. "Okay Cody let's see how well your brother taught you." Cap motioned Cody over to the hydrant. Cody moved into position with his feet slightly apart and his knees slightly bent. He raised his hydrant wrench above his head and called, "Ready." Cooper raised his hand in the air, "Hold on." Then he watched the little hand circle the stop watch until it was time, "Go." Cody quickly had the caps removed and the hydrant flushed, but he had trouble connecting the supply hoses. By the time he got them in place and the water pressure on he had passed the required two minute mark by 48 seconds. He slammed his wrench against his leg in frustration. "I can do better Cap." "Well Cody that wasn't too bad for a boot. Let's see how well you reverse your actions." "Okay Cap." Cody turned back to the hydrant and stood ready. He didn't fare much better in reverse. He only shaved six seconds off his other time. Neither he nor Swanson had passed the drill. Johnny had beaten the best time at the station. "Okay men these basic skills are very important to the success of our team. Those of you who lack the mastery of these basic skills will be required to practice during your down time at the station. Poor basic skills leads to poor fire ground operations, and that my boys can lead to unnecessary injuries and even death. I won't stand for that in my unit. Scotty, show them how it's done." Dale Scott approached the hydrant and in one minute forty two seconds he had completed the first half of the drill. Johnny's time was still one second faster. Scotty then turned off the water pressure, disconnected the hoses and recapped the hydrant in one minute thirty eight seconds. Again Johnny's time was still a few seconds better. Scotty stood up and turned to face the boots. "That, my friends, is how you work a hydrant." He strode back over to his engine and pulled off his turnout coat. "Good job Scotty. Now each of you probies will grab a 2 ½ from your respective engines. We will lay them out and turn on the water pressure. The drill consists of you getting control of your rogue hoses." All three men went to their engines and pulled the requested hose. They spread them out and backed away. The other crew members moved back away from the area. They knew the hoses would snake up and throw water all around. They hoped their new recruits would get the hoses under control quickly so they wouldn't get wet. All three boots would perform this task together. "Charge the hoses," the Captain called to the three Engineers. All three men, Johnny, Jeff, and Cody moved to retrieve their loose hoses. Cody and Jeff immediately dropped to their knees and began crawling down the length of their hoses as they whipped from side to side and rose up into the air like a giant snake. Johnny chose to move up further on his hose before dropping to his knees. Then he quickly advanced to the end and was able to shut off the valve and secure the hose. He laid his hose down and walked back toward the engine. Cody had seen him finish the drill and when he reached the end of his hose instead of turning off the water he turned the spray toward Johnny's departing back and knocked him off his feet. Then so it would appear to be an accident he fell backwards himself and allowed the hose to slip from his hands again. Jim saw his brother go down, and he ran over to his side grabbing the hose and shutting off the nozzle. "Cody what the heck are you doing? If Cap thinks you did that on purpose you could be washed out." He whispered to his brother as he helped him up. Johnny had the air knocked out of his lungs. Dale Scott and the two men from the Rescue Squad rushed over to see if he was hurt. They slowly turned him over on his back, "I'm o..okay. Just got the wind knocked out." He laid his head back to the asphalt and took several deep breaths trying to get control of his breathing. 'Well I guess it's starting. Just like at the academy. I do well, and they retaliate.' He closed his eyes and concentrated on continuing to take deep breaths. While he lay on the ground the other crewmen returned the hoses to the engines and prepared to return to the station. "I guess that's enough for today. Gage are you alright?" Johnny slowly sat up meeting his Captain's eyes. "Yes sir. I'm alright, just winded." He knew he would be really sore tomorrow, but he wouldn't give Cody Graves the satisfaction of sending him to the hospital on his first day at the station. Arriving back at the station a short time later everyone scattered. The kitchen detail set out to prepare dinner while everyone else either finished their duties or found something to do until dinner. Johnny went out back to shoot basketball with some of the other guys. At first he stood off to the side not sure if he should just join in or wait for an invitation. After a few minutes someone called out to him, "Hey Gage, do you want in or not?" "Yeah, I'll play." The ball shot in his direction. He caught it and immediately dribbled toward the goal. Going in for a layup he made the basket. The group played around taking turns shooting from different positions around the lot. Dale Scott joined the group, "So Boot, it looks like you have some skills." Johnny shrugged his shoulders, "I guess." Scotty dribbled out and turned tossing the ball easily through the hoop from a 3 point distance. "Show me what ya got." Coleman grabbed the bouncing ball and tossed it to Johnny who in turn dribbled out to where Scotty stood. He dribbled a few more times lifted the ball almost to his chin…lowered it slightly…twirled it in his palms and with a slight bend of his knees he pressed the ball into the air in a high arch toward the goal. It hit the backboard and bounced off the rim slipping through the net. Several cat calls echoed across the back lot. Scotty slapped him on the back. "You're okay Boot." Johnny smiled and excused himself. He felt tired and still a little sore from getting knocked down earlier. "I think I'm gonna head inside." He disappeared into the back door and made his way to the locker room to get some aspirin. Opening his locker he found a kid's toy tomahawk and a wig. He stood momentarily motionless, his mouth open; his shoulders slumped. He ran his hand through his hair and dropped it back to his side. Scotty had followed him inside wondering if he was really alright or if he had actually been hurt from the high pressure impact of the water blast to his back. He stopped half in the door and half out watching as a deep sadness moved across Johnny's face settling in his eyes. Johnny sighed and reached for his bag pulling out the aspirin. Scotty walked over and took the tomahawk and wig out of the locker and tossed them in the garbage. "They don't mean any harm Johnny. It's just because you're a Boot. That's all." "Yeah sure," Johnny said quietly. Reaching in his locker he grabbed the novel he had brought to read, turned closed his locker, tossed the aspirin in his mouth dry swallowing, and left the locker room. He climbed the two flights of stairs to the dorm room. He could hear a ball game on the TV and several voices cheering on the opposing teams. He lay down on top of the blanket on his bunk and read for a while. Becoming drowsy he raised his arm draping it across his eyes to block the light and fell asleep. He was still there an hour later when he woke up to a gentle shake. "Gage, dinner, come on wake up." He opened his eyes slightly and peered up to Jeff Swanson standing over his bed. "Come on man." Johnny turned over on his side and mumbled something incoherent. "Gage, Cap said you need to come eat." Swanson was getting aggravated. "Come on!" Johnny slowly got up and sat on the side of his bunk. "I'm coming." His back and shoulders ached. He rubbed his palms over his face and yawned deeply. Before he could get up from the side of his bunk the tones sounded again. Johnny and Jeff, along with the others that had been watching the ball game all headed for the fire pole. One by one, they descended to the bay area below. Sliding down a fire pole was another of the things they trained to do properly at the academy. Although it is seemingly simple to slide down a pole, like everything else a firefighter does while on duty, there is a proper procedure. While waiting for his turn at the pole Johnny thought back to the man who had led the training that day at the academy. "Now men it is very important that you follow proper pole technique." Snickers traveled through the group of young recruits. "You may think this is funny, but there have been serious injuries due to improper pole techniques. The Fire Department has lost valuable man-hours and experienced costly medical bills due to these improper techniques. Today I will review with you the only allowable methods of descending the fire pole." The instructor had been so serious, and no one really paid attention. The recruits, like many before them, thought it was ridiculous to need to be 'trained' to slide down a pole, until it was their turn to make the first trip down. The 'training' pole was highly polished and the trip down for most of the men was uncontrolled and fast. Some of the men had landed on their feet while others had fallen when they hit bottom and hit hard on their rears with their feet sprawled out in front of them. Then the trainer had brought out the pictures. He had several pictures of men in casts, on crutches, and with slings on their arms from dislocated shoulders and sprained wrists. Then he had one very disturbing picture of a very young looking man in a wheel chair. "This was one of the worst pole accidents in the LA County Fire Department. This young man missed his mark at the top of the pole and fell to the concrete bay floor below. He damaged his spinal cord, and as a result, he is paralyzed from the waist down. Gentlemen, this is no joke." Shocked gasps and mumbling moved through the group as the picture went from man to man. "Now that I have your undivided attention, let me explain to you the proper method for reaching the bottom safely." He reached out to grasp the pole at chest height with both hands one above the other. He pulled himself to the pole while simultaneously wrapping his legs around it tightly. 'Wrapping your legs tightly around the pole will control your descent.' He remembered the trainer stressing the proper way to wrap his long lean legs securely around the pole. It seemed to Johnny that the whole changing of his grip wasted too much time and he had decided to maintain his original hand placement while loosening his grip. To him that seemed faster. He had tried the arm hook method, but didn't see the need to make that change. Johnny's feet hit the ground, and he immediately moved away from the pole and jogged to the Engine. He grabbed his turnout coat and whipping it around his head had it on quickly. Then glancing back to the pole he smiled and climbed up to his seat. The Engine was immediately in motion and Station 10's vehicles once again paraded out of the bay into the street. Johnny directed his attention to the calls on the Engine's radio hoping to hear what they were responding to. Before they made it two miles down the road their call was canceled by dispatch. "Engines 10-A, B, and C cancel response. Ladder truck 10 and Rescue 10 report to Captain Hammer at scene for instructions. LA out." Captain Jones looked back at his men, "Well boys looks like we'll get dinner after all." Some time later that evening the Ladder truck and Rescue Squad returned to the station. Gary Cooper gathered everyone out in front of the station. "Captain Jones wants to get a picture of the three new men in front of the station on their first day before the sun goes down. So if the three of you will line up over here in front of the Squad." Johnny, Cody and Jeff all stood in front of the Squad. "Gage you're the tallest. You should be in the middle," Bill suggested. Several of the other men from the shift gathered behind Gary to watch them take pictures. "Okay, I need you to back up a little. There's a glare from the bumper. That's right a little more…"
The three probies moved back a step. Several of the onlookers also had cameras. Johnny thought this whole picture thing was starting to get a little bit odd. 'How long did it take to get three guys to stand in front of the station for a picture?' Then he heard a noise from the roof. Dust trickled down from above. He glanced up just in time to see water pouring down on the three of them. He raised his arms and lowered his face trying to block the water. Laughter rained down on them from above along with very cold water from three five-gallon buckets. The on looking firefighters stepped back from the splashing water. For the most part they had stayed far enough back to avoid getting wet. Camera flashes seemed to come from every direction. Jeff and Cody both ran out from the waterfall. Johnny stepped back under the safety of the bay door. All three men were soaked. Everyone including Captain Jones laughed at them. Johnny thought it felt good to be a part of the stations' initiation when it wasn't just directed at him. He smiled a huge crooked grin and laughed with everyone else. Dale Scott walked up beside him and patted his shoulder. "You look like a drowned rat." "Hey Gage what was that move you just made a rain dance?" Jim Graves commented. The happy mood dissipated quickly for Johnny. Johnny turned abruptly and went to find a dry uniform. He pushed the locker room door open with great force causing it to bang back against the wall. He stalked over to his locker and jerked open the door; then he paused, breathing hard, he looked down at his wet clothes. His hands balled up into fists. He had promised himself that he would not let them get to him. He took a deep breath stepped back and lowered himself to the bench. Scotty stood again watching the young boot battle his own emotions. "Some people are just ignorant John." He didn't know Scotty had been watching him. He looked up at his new friend. "Yeah." He slowly got up and continued changing his clothes. "You did look like a drowned rat." Scotty tried to lighten the mood. Johnny huffed a small laugh. "They really got us good." He finger combed his regulation style hair cut. "Works every time," Scotty told him. "You mean you guys do that to everybody?" "Yep. They did it to me. Captain Jones was the Engineer at the time. He was the one who dumped that cold water on my head." "You're kidding?" Johnny asked with a shocked expression on his face. His mouth was open and his eyes wide. "Well he hasn't always been a Captain you know." Johnny smiled and laughed again. "I guess not." Bill popped his head in the room, "Hey Scotty it's time for the ABC Movie of the week. We're all heading up to the TV. The popcorn is already made. Ya'll coming?" "What movie is it this week?" Scotty asked. "Some football movie called "Brian's Song" about a couple of Chicago Bears running backs. Supposed to be pretty good." "Okay Bill, we'll be right up. Come on John let's go watch a movie." As they moved to leave the locker room Jeff and Cody came in to change. The two men were still dripping wet. They were smiling and laughing as they entered the locker room. "Man Johnny that was funny wasn't it. I mean it was cold but it was classic. We just got initiated into the club." Jeff slapped Johnny on the back. He was beaming with pride at having a five gallon bucket of water dumped on his head. "This is great. Just great." Cody shot a glare at Johnny. His smile had faded as soon as he had seen Johnny in the room. Scotty looked down at Johnny's feet, "Your feet are squishing," he said chuckling. "Well my shoes are wet." Johnny had stopped in his tracks and looked at his feet. He looked up at Scotty and placed his open hand on his chest, "I only have the one pair." "First chance you get you'll be getting yourself an extra pair of shoes. In this business, your feet are always getting wet. There's nothing like cold wet feet to make a guy miserable. Mark my words, by next shift all three of you will have an extra pair of shoes." Scotty smiled at the three young men. "And sox. You always need extra sox." Cody seemed bothered that Johnny had become fast friends with the top Engineer at the station. Jim had told him about Scotty being second in command and it seemed that Gage had already sucked up to him. Scotty slung his arm around Johnny's shoulder, "Come on Boot, I want some popcorn." Johnny smiled, his upset at the unkind comments about rain dances forgotten, and together they left the locker room.